By Paige Neidig – There is something about autumn that awakens the senses! We gaze upon the beauty of vibrant and colorful leaves falling from the trees, smell a campfire on a crisp fall night, hear leaves crunch beneath our feet as we walk, taste freshly baked pies of the apple and pumpkin variety and feel the warmth of a cozy sweater wrapped close around us during these fall days and nights. In Gettysburg, these 10 things will give you all of the fall feels! Gettysburg is beautiful any time of year. However, take a carriage ride on the battlefield or a drive through the Adams County countryside in October, and I promise it will take your breath away. Stunning shades of red, orange and yellow illuminate the trees and the ground they fall upon. These autumn hues accentuate the beauty of an already stunning landscape. With over 50 years under its belt, it doesn’t feel like fall in Adams County without the National Apple Harvest Festival. This two-weekend event is full of traditional Pennsylvania fun – pony rides, pie eating contests, tractor square dancing, hayrides and more. And don’t forget to try some unique apple foods like apple pizza, apple slushies and apple sausage while you’re there! Many call Gettysburg one of the most haunted places in the United States. Whether you’re a believer in ghosts our not, there’s something thrilling about walking around town in the dark listening to the spooky stories of those that have returned to Gettysburg in the afterlife. And there isn’t a more perfect time to do this than around the time of Halloween! Take a leisurely stroll through the battlefield or a walk downtown during the fall months and you’ll hear the sound of leaves crunching beneath your feet with every footstep. This sound is sure to bring you back to your childhood days of raking piles of leaves only to jump in them and watch the colors fly around you. Just a short drive from Gettysburg, a farm adventure awaits you at Fields of Adventure. There is no shortage of fall fun at Fields of Adventure! Make your way through a corn maze, pick-your-own pumpkin, take a hayride through the countryside, feed some adorable animals at the petting zoo and try out the zip line this fall! Fall means the release of Adams County Winery’s Dancing Pumpkin wine! This flavorful wine will invade your taste buds with everyone’s favorite fall flavor – pumpkin. It also means fresh apple ciders from our local farm markets. Or if you’re looking for an adult cider, we have hard ciders too! Sip one of these wrapped in a blanket by the fireplace for a cozy fall evening. Adams County’s orchards are absolutely beautiful! And there is no better way to appreciate their beauty than to walk amidst them and pick the brightest and juiciest apples right from the tree branches yourself. You can enjoy the apples just as they are, or bring them home to bake into a pie, dumpling or strudel. Who doesn’t like wrapping up in a warm fuzzy sweater when the temperature begins to drop? Gettysburg has some cute boutiques downtown for your fall fashion needs and of course The Outlet Shoppes at Gettysburg. A new fall sweater and a pair of ankle boots are necessities to complete your fall wardrobe! Surrounded by history and countryside, Gettysburg is an exceptional spot for camping. Those cool and crisp fall evenings at the campground aren’t complete without a campfire to cook over. Check out our list of the Top 5 Recipes to Make When You’re Camping in Gettysburg! Get in the Halloween spirit, and maybe encounter a few spirits too, at the Annual Olde Getty Place Gettysburg Halloween Parade. Bring the kids and watch the floats, marching bands and baton twirlers in the parade. And don’t forget to check out the Halloween costumes! Make sure you get in a visit to Gettysburg this fall to check all of these off your fall bucket list. And let us know if there is anything else that signifies fall in Gettysburg for you! October is a great time to visit the area! We recommend the Scenic Valley Tour. It’s a driving tour through the Adams County countryside – which has stunning views in the fall. 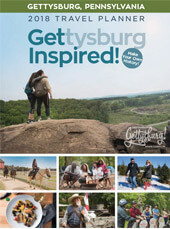 More info on the tour, including a download of it, can be found at this address: http://www.destinationgettysburg.com/members/scenic-valley-tour.asp. Another great option would be a battlefield tour – the battlefield is gorgeous in the fall. You can find a self-guided auto tour map of the battlefield at his address: https://www.nps.gov/gett/planyourvisit/upload/GETT%20brochure.pdf. Please let us know if we can be of any more assistance in planning your trip! Thank you for our quick reply and information. I will be in Gettysburg in October for a Road Scholar tour of three Civil War Battlefields. I’m sure we can work something out so that we can enjoy the fall colors and the area. I’m looking forward to it.